Obtaining a Papal Blessing, or Benediction Papalis, can be a thoughtful and meaningful way to commemorate a special life occasion. It is a blessing from the Holy Father to honor important events in the life of a follower of the Catholic Church. While the Pope’s blessing itself is impossible to see, the Benediction Papalis can be immortalized on a special document issued by the Chancery. 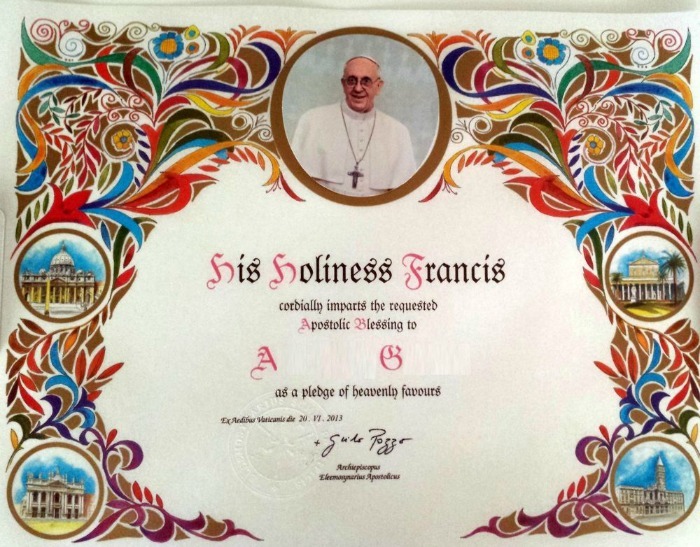 The one of a kind parchments are hand painted and inscribed with the names of the blessed. Any baptized Catholic can receive a blessing, but they are not bestowed upon non-Catholics, the very young (before they have been baptized) or the dead. For this reason, blessings cannot be given to commemorate births or deaths. They will, however, be issued for such events as birthdays, Baptisms, First Communions, Confirmations, conversions and Catholic weddings. It is not possible to obtain a blessing for an event that has already taken place, but you may request blessings for anniversaries of dates like weddings and confessions of faith. Another key issue to remember is that only baptized Catholics can request the blessing, either for themselves or friends and family members. The blessing is free, but the Church does request a donation for the certificate, which will be donated to a charity for the poor. It can take several weeks or even months to receive the Benediction Papalis, so we have compiled a list of all the necessary steps to make the process as easy as possible. Obtain a letter from your parish priest on church letterhead certifying that the persons concerned are Catholic and in good standing with the Church. Contact your diocese’s Chancery Office or parish secretary to begin the process of selecting the style of parchment and discussing to whom the blessing should be addressed and for what occasion. The diocese will request a check for the blessing. The donation cost varies based on the quality and design of the parchment selected. They range from approximately 25 to 40 Euro. For Weddings: Provide the full name of the bride (maiden name), the full name of the groom, the date of the wedding, the name of the Catholic church, as well as the city and place where the ceremony will be held. For First Communions and Confirmations: the full name of the recipient of the sacrament, the name of the church, city and state, and date of the reception. For Anniversaries: the full names of all parties involved, as well as the date to be commemorated. While it is possible to obtain a blessing from anywhere in the world by going through the proper channels in your home parish, the process is greatly speeded up if you are able to personally request the blessing in Rome. Visit the Papal Blessing Office inside the Vatican City walls on the Via del Pellegrino, remembering to bring the same information required above regarding the event and the recipients. Rather than 8 weeks, in-person requests usually take one to two weeks to process and can be picked up in person or mailed anywhere in the world. You can also contact the Office of Papal Charities directly. Be wary of websites offering Papal Blessing online as most are scams. It is always best to pursue the blessing through official channels.